The beautiful pothos plant is one of the most popular houseplants around. 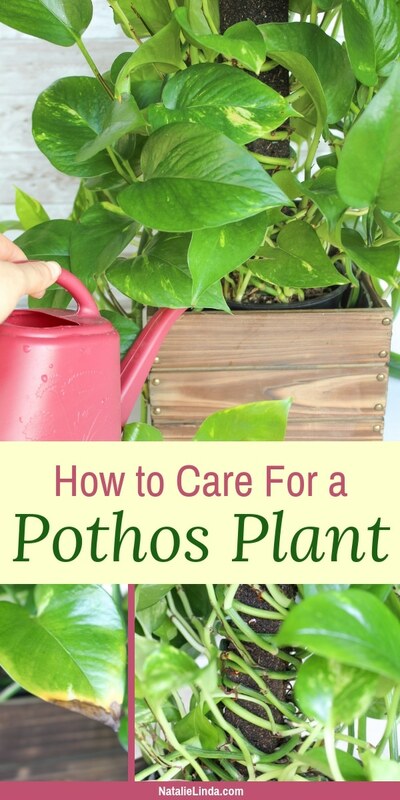 Known for its vining leaves that can withstand some serious neglect, the pothos plant is the plant I recommend most to gardening beginners who want to ease into growing plants. Once you know how to care for a pothos plant, it’ll grow for you for years and even decades to come! My mom has a large pothos plant that she’s had for over three decades. She loves that plant so much and she loves to tell people how long she’s had it. She always says something like, “I’ve had my pothos plant longer than I’ve had my 3 adult kids!” lol. These plants have some serious longevity. She bought it when it was a tiny little plant and now it’s several feet long and drapes down to the floor. Pothos, also known as Devil’s Ivy, is practically foolproof. Even though it’s so beautiful, it’s a low-maintenance perennial plant that doesn’t require a lot of attention from its grower. It’s essentially a very independent plant. 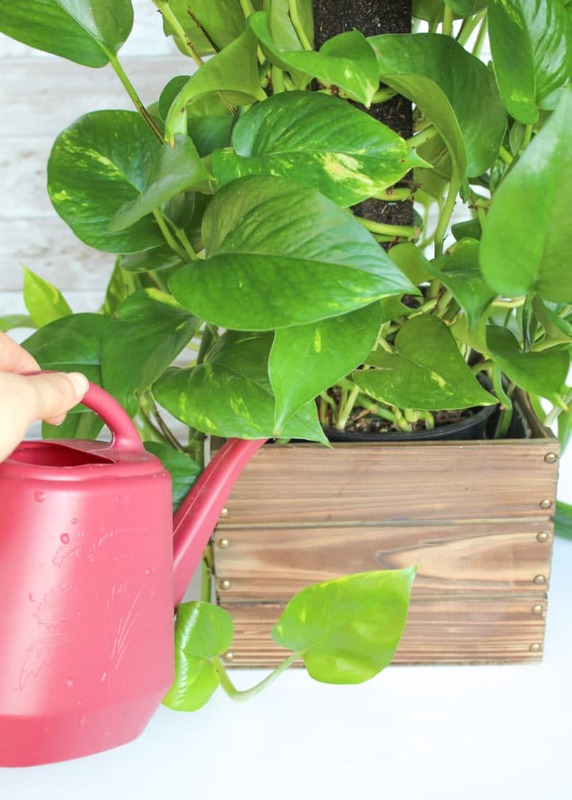 To properly care for a pothos plant, you need to provide it with a good pot that has a drainage hole, indirect sunlight, and a little water every now and then. This means you can grow a beautiful plant with very little effort on your part, and THAT’s why every gardening beginner should start out with a pothos plant. It’s not just easy to grow, however. It’s dark green, heart-shaped leaves can beautify the dullest area of your house. Stick it in a boring area of your house and watch it come alive! Plus, it’s an air purifier. That’s right, one of the best reasons to grow houseplants is that they remove airborne pollutants. It’s probably what attracts me the most about growing an indoor garden. A free and natural air-purifier? Sign me up. If you’ve been gardening for several seasons now and live in a climate, house plants give you the opportunity to keep your gardening passion alive for the entire year. By growing pothos indoors, you’ll be able to satisfy your love of taking care of a plant and you’ll get to see it flourish throughout the seasons. If you purchase a potted pothos plant that has already begun to grow (which is what I recommend) you can enjoy it as soon as you bring it home. 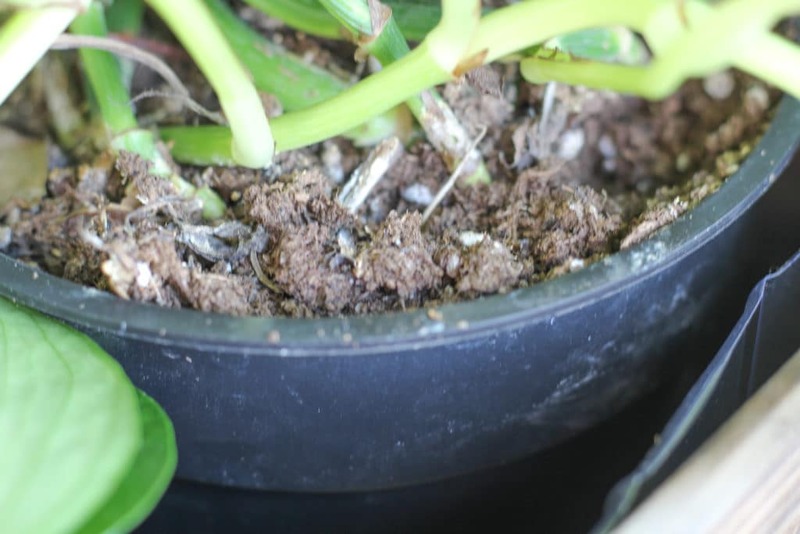 What Type of Container and Soil Should You Use For a Pothos Plant? Pothos plants aren’t fussy so you can use any container you want as long as it has a drainage hole at the bottom. 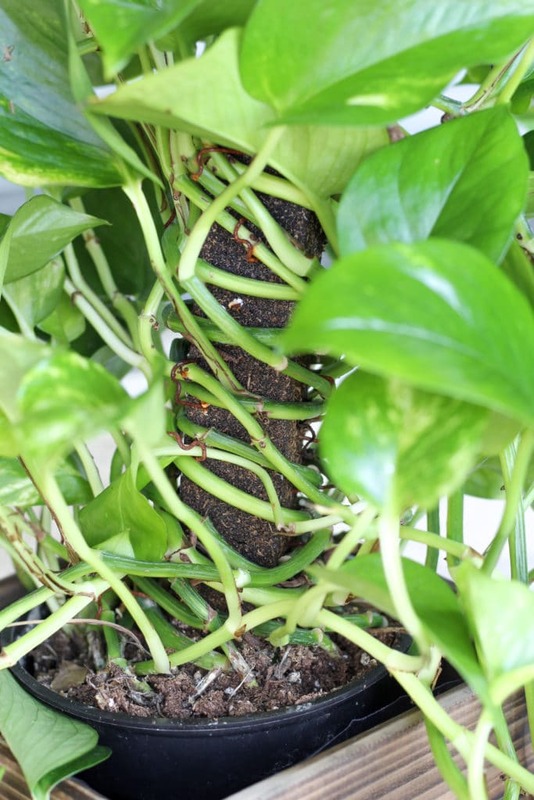 A drainage hole is crucial to successfully grow pothos – it what will prevent the roots of your plant from rotting! If you purchased a potted pothos plant that has already begun to vine, don’t worry about repotting. Pothos plants don’t need to be repotted unless the roots have grown so large that they’re preventing water from pouring out through the drainage hole. 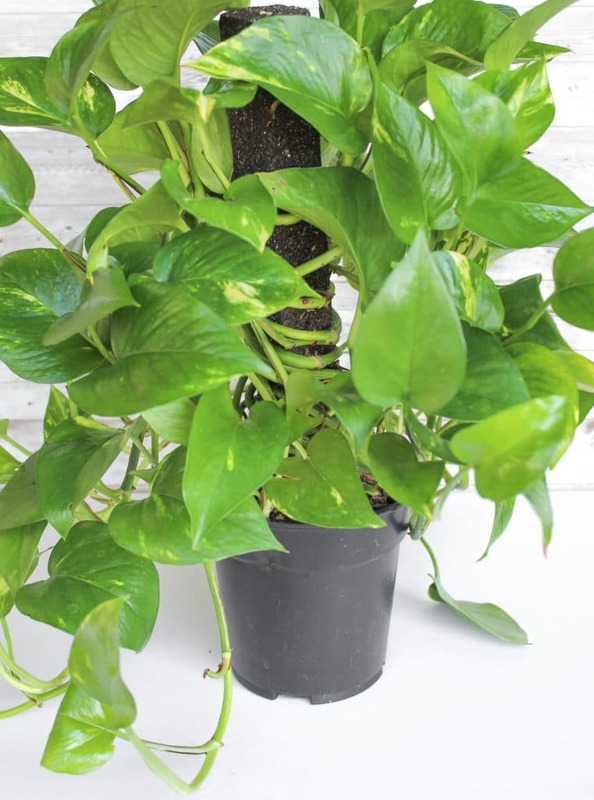 Pothos plants actually thrive in smaller containers and can grow several feet of vine without being transferred to a larger pot. Smaller pots will also help contain the plant so it doesn’t grow overabundantly. This plant also grows beautifully in hanging baskets and totems placed within the pot, as shown below. If your pothos came in a plastic container, that’s perfectly fine, just be aware that plastic containers retain more water than clay or terracotta pots, so you’ll have to be careful not to overwater. This is an important part of learning how to care for a pothos plant! As far as soil, the best soil for pothos plants are ones that are well-draining. Similar to succulents, pothos plants don’t do well when they sit in soggy soil for days at a time. Believe it or not, photos plants don’t need a lot of water. I once made the mistake of giving my pothos plant too much water, and it made it very apparent that it was NOT happy! How did I know I had overwatered my plant? A few days after watering, I noticed a white fungi growing on the top soil, as shown below. There was also a slight moldy smell coming from the pot. Fortunately, this fungi will not kill your plant, but it is a warning sign that you should stop watering so frequently. When you see this fungus, simply scrape it off the top of the soil, and discard. Then you can pretend it never happened, lol. Pothos plants, like succulents, should only be watered when the soil has gone dry. I usually water my houseplants about once a week or a week and a half. When the soil feels dry about an inch deep, I grab my watering can and water my pothos directly into the soil, as shown below. (TIP: Do not spray water onto the leaves of your pothos, this is unnecessary and pointless, too). Continue watering until you see water escaping from the drainage hole. This will serve as your sign that water has penetrated the soil and provided the roots with enough moisture. Make sure to discard the extra water from the saucer, as you don’t want the roots of your plant to sit in that water for too long. Your plant will let you know whether it’s receiving the right amount of moisture. If you start noticing that the tips of the leaves are turning black or dark brown as if they’re sunburned, this means you’ve been overwatering your plant. In contrast, yellow leaves are an indication of underwatering. It usually means you let the soil stay dry for too many days. Don’t panic, though, your plant should be fine as long as you start providing it with enough water. This is what’s so fascinating about pothos plants and houseplants in general: they’ll let you know what’s going on with so you can resolve any issues before it’s too late! You might think you can’t grow pothos inside your home because you don’t have enough windows that let in sunlight, but you can. Pothos is a plant that actually thrives in low light areas. It’s why so many people love growing pothos in dim corners of their house, inside of bathrooms, or on their desks in their office or cubicle. In fact, pothos plants do better in low light environments than they do in direct sunlight. Try to give your pothos plants a few hours of indirect sunlight each day. Near a window is best, if possible. If you can’t get a couple hours of indirect sunlight, they will survive on less. Pothos plants do best in temperatures of 60 – 80 degrees Farenheight, and shouldn’t be grown in less than 40-degree temperatures. It is, after all, a tropical plant. You can apply fertilizer to a pothos plant to help is retain its vibrancy, but it’s usually not necessary. As long as the soil its planted in is of good quality, the plant should be receiving all the nutrients it needs to grow and thrive. If you’re curious to see how your plant will benefit from regular fertilizing, I recommend a liquid fertilizer. Start with smaller does and mix the liquid fertilizer with water in your watering can. Do this about every two weeks, once a month, or at the beginning of Spring and Fall, just as when fertilizing succulents. Houseplants are just about the easiest plants to prune. If you see any dead leaves or leaves that look unattractive, go ahead and prune them off. Simply yank at the leaf until it rips off from the stem. You can also use clippers to shorten any overgrown vines that you want to tame. It’s easy! Pruning is an important part of photos plant care because it’s what will keep the plant growing the way you want it and will also rid it of any free of dead leaves, which can attract garden pests. 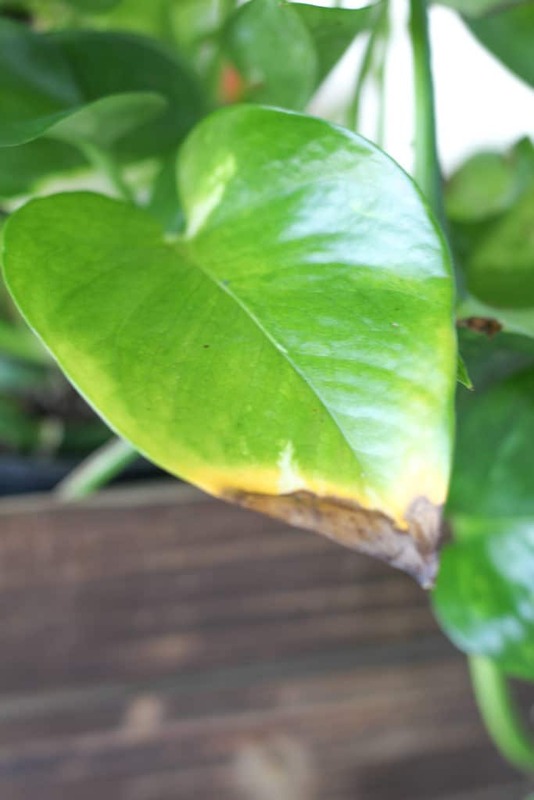 Pest won’t be a huge problem when growing pothos plants indoors, though you might come across insects such as mealybugs. Mealybugs are easy to get rid of, so don’t worry too much. Mealybugs are white, cotton-like mounds that spread quickly and can spread from plant to plant if not eliminated. The best way to get rid of these pests is with rubbing alcohol. Simply dip a Q-tip in the rubbing alcohol and swipe the leaves clean. If the problem is worse than a few mounds, you can spray the leaves and topsoil with water and alcohol. So this until your plant is free from bugs. 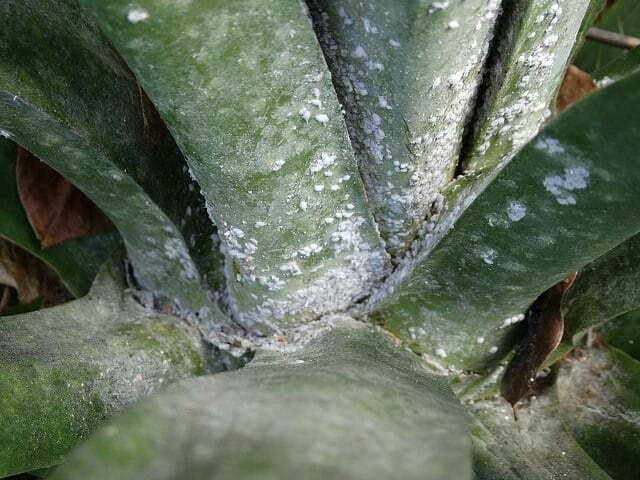 To learn about mealybugs and how to eliminate them, read my how to get rid of mealybugs post. « What’s Wrong with My Succulent? I’d always referred to these as philodendrons. Mine is almost 14 years old.